Over the years many of you have asked about ways to support me and John financially, which is super flattering, but I never wanted to go down the road of shaking the virtual coffee cup for spare change, as it were. The good news is I really LIKE my future plans, and I think you guys will, too. The only trick is making sure John and I can continue to make a living doing what we love. If you don't see it, scroll down a bit. I'll wait. 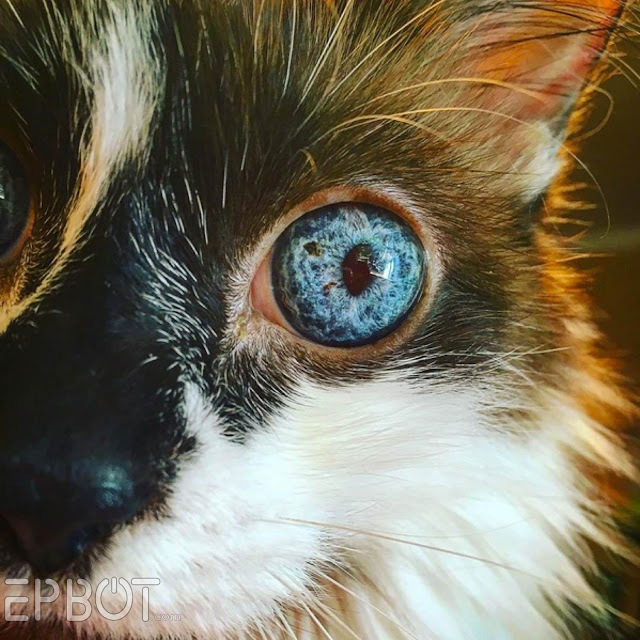 By clickety-clicking those buttons, you can either become a monthly Epbot supporter through PayPal (for as little as a dollar), make a one-time donation (also for as little as a dollar), or, YAY FREE OPTION: shop Amazon through our affiliate link. With holiday shopping upon us, just using that link alone would be a hugely wonderful thing. I do know about Patreon, but this is kind of a test run to gauge interest. If enough of you are crazy sweet enough to want to help keep Epbot going, then I have some fun ideas for prizes, raffles, etc. for supporters. And if we end up with tumble weeds, well hey, then I'll know this was a dumb idea. Barring that, I want to keep sharing projects and photos, making you laugh (and maybe sometimes cry), and geeking out with you for as long as you're willing to read my nonsense. In fact, I hope to get to do even more of it! ... and I guess Tonks' face, too. Quick Update: You can tell I'm new at this, because I forgot to mention that particular Amazon link only works for U.S. purchases. Boops. Here's the link for Canada, and here's the one for the U.K - though the U.K. referral program is apparently going away soon. If enough of you would like it, I'll see about adding Canada's Amazon link to the sidebar, or we could do the same thing we do over on CW, and include the links in the footer of every post. Unless that'd be too annoying. Um. What do you guys think? I always use your Amazon link (I shop like a hermit. My toilet paper comes from Amazon. Not even kidding), but I'm like robynwithay, I never know if it works or not. Is there a way we can make sure it does? 'Cause seriously, if you get even a tiny percentage of what I spend there, you can feed the cats. Like, all the cats. In Florida. Maybe in the world. I'm an Amazon addict. Hmm, I don't think there's any way to double check, but that link should do the trick, no worries. And thank you guys! Updated my Amazon bookmark with your link - super happy to support you! I never want my laziness to prevent that beautiful kitty for getting fed! Cat food is on the way. Good luck with the new endeavor! I will use the Amazon link more often. We need you and John to stay online and in our lives. Plus, I need to see more pictures of Lily and Tonks! what about Canadians? when I hit the amazon link, it asks me if I want to go to the Canadian site-would you still benefit from that? I'm wondering that, too! I do a fair bit of shopping on amazon.ca. Ah, good point! We do have a different link for Canada, but it gets so little use over on CW I didn't think to include it here. Here's the link for now, which is on the bottom of every Cake Wrecks post. If enough of you want it, I'll figure out a way to include it in that sidebar permanently, too. Thanks! Great, thanks! I'll also set an exception for this page in my Adblock thingy. I didn't realize it made that much of a difference! I"m wondering how affiliate links outside of the US. Do you know if your link will work when I click through to amazon.ca (after clicking your amazon.com link)? No, they make it tricky: every country has its own separate Amazon link. I have links for the U.S., Canada, and the U.K. - though we just received word the U.K. is discontinuing their referral program soon. (Boo.) I added the Canada link above, and I'll see about getting it added to the sidebar. I, too, am more than happy to support your delightful endeavors, but could use a little clarification on the Amazon link. If I already have stuff in my cart (from days of browsing), but then I use your link to actually check out, does that do the trick? Or do I need to start over with your link to get it to qualify? I will also be donating through PayPal because you & John are so awesome and fabulous, so the kitties (and you) will get to eat either way. But I'd like to make sure the Amazon shopping is helping too. That said, I would *guess* you have to add the actual item to your cart through the link, but don't worry about going through the trouble; just keep us in mind for next time! I have a small suggestion. Because I often put things in my cart intending to buy them at a later date. If you put all of your items in your cart into your saved for later cart and then back in after you have used the link on EPBOT it should work. I have been using it for the amazonsmile campaign this way and it seems to work. I will switch to EPBOT now. I buy almost everything except perishables through Amazon. I'm talking even my soups and cocoa and stuff. I hope this works out for you. I would miss you so much if you weren't Epbotting any more. It's not a lot (I chucked in $5 - for now), but I'm happy to help you all out. I've spent many a delightful hour on both of your sites. I'm inspired by you both SO MUCH. I still wish to meet up with you someday at our beloved Disney World for a dizgeek out. :) (Or finally find you all at D*C.) Either way, I'm happy to join the proverbial commune. Cheers! And I'll use your link from now on for Amazon purchases - and boy, howdy, do I use me some Amazon! I'll admit to being too lazy to click over from my RSS feed. Never again! I will stand up and be counted! Oh, one more quick thing... if you build the geeky commune, I will *totally* move there and be the nurse for the community. Now, granted, I'm a jail nurse, so my bedside manner is a bit rusty. BUT, as an added bonus, I remain calm and level headed when people are shanked, and know a multitude of ways to heal facial lacerations with little to no scarring. Just so you know, this is one of my favorite comments on Epbot ever. OMG, I just about fell out of my chair laughing at this comment. I know some plastic surgeons that could be willing to pay big bucks for your services! I'm in on the commune thing. I will donate my sewing skills to the community if that helps. I also am willing to cook if someone else cleans up! Since I was a paramedic (a looonng time ago) I could help Emily with some of her new appointed duties. Count me in for the commune. I'll be your librarian. Let's do this! Yeah I'm totally down for the geeky, crafty, Steampunk-y, Disney-y commune. I'm in IT with a healthy side dose of crafting, cosplay and dressmaking. Our commune could dress exclusively in Cosplay. Obviously we will also have cats. Many many cats. I'm in! I used to be an athletic trainer, so I could tape everyone's ankles before a Con. I also know how to clicker train cats and I can bring my cello for the garage band. Zippy, I also have pepper spray, that could help with the lines even more! All- this goes to show that I have truly found my tribe. Who else but us could have a geek commune that laughs at shanking jokes. Yup... when are we moving?! I'm an audio geek - so I got the crazy concerts/Karaoke Nights covered!!! I'm in. I'm an awesome cook and I love to cook for crowds! Lets do this! I bet my patients are bigger babies. LOL!! My people! >sniff< I throw my physical therapy skills into the pot, along with gardening; the cat, of course, is an artiste and nothing more need be said about his skills. This blog (and Cake Wrecks) is so much cheaper than therapy, just as effective and 1000% more fun. I'll happily pay for your and John's brilliant writing and crafting skills just like I would any other vendor who provides a service I've come to rely upon. Can't promise anything. Amazon.ca is not a thrill to shop in, which may be why you don't get many Canadians using that link. :P But you are absolutely worth it! I do way too much amazon shopping, so I'm happy to do that. How does that work? Is it like a per clicks thing or a dollars spent thing? It's a small percentage of your total purchase, so dollars spent! I am so glad you are doing this. Between Epbot and Cake Wrecks, your blogs as are important to me as the books I love. I'd so happy to use my PayPal to keep these going. And maybe you could put together your how-tos in a self-published ebook or something? It's a pity that amazon uses different programs for different countries.. so that's not an option for me here in good ol' germany... but luckily paypal is more international ^^ that's a good way to say thank you for all the wonderful (and sometimes very personal and oh so relateable) things you share with us! It may not be much but it comes from deep within my heart. Throwing in a vote for Patreon here. My experience supporting an artist I admire on Patreon over the last six months has been overwhelmingly positive; I'd totally support you too if you set up an account. Hey, one of your younger readers here. I don't have a steady job or Amazon account, so I couldn't really help in that respect, but I know that in some blogs, clicking ads will sometimes give more money. Does that work with your blog? No, but reading Epbot here (as opposed to RSS) without Adblock on does! Our ads don't pay per click - only per page view. And thanks for being so sweet. You guys are totally gonna make me cry before the day is through. That's good then - I only EVER read this blog by coming to the page. I like to minimise the window so I can't see the ads lol. But they do load so I guess they contribute to revenue. What about reading it through the bloglovin feed reader? I still see the full post page, just nestled inside the bloglovin page. Well, I should probably google my problems before I ask you about them. I was NOT contributing to page views, due to bloglovin' frames. I have changed that in my settings. I can still use the feed to see the list of updates, but clicking on them will take me straight to an un-framed post. VIEW THOSE ADS! MAKE THAT MONEY! I don't often comment, but I read your blog religiously. It means a lot to me, I love you and John, and I look forward to every post. So I'm more than happy to donate. I sent over a small donation today, and I'm sure it won't be the last time I do (just need to get paid). I couldn't sign up for a subscription fast enough. It's the least I could do. I'm the balloon chicky who twisted your Epbot Bot balloon on facebook. You shared it to your time line and the amount of feedback I got was unbelievable. I hadn't thanked you for that properly yet because I was making a handmade card (with paper balloon animals!! Squeee!) when I got too busy. So, if I can help? I'm gonna do it. And hopefully the more business I get, the more I can throw your way. Your blog means so much to me on several levels. Hi! I am pregnant and have a registry through amazon. Do you know if it is possible to link to my registry page through your revenue button, so that if someone clicks on my registry and then buys an item, you get credit for it? Wow, that's a cool idea! Hmm, I bet you could do it, but it might be a little tricky. You can grab our affiliate link by right-clicking & choosing "copy link location" - but that just leads to Amazon's home page. Once you paste that into your own link, you'd just have to adjust the html address to direct to your registry page instead of the home page. Shouldn't be too hard, if you're familiar with poking around in html. If it does work, please include a little note saying "using this link helps support a blog I love" - just so nobody feels like Epbot is hijacking their clicks. Odds are they'd never even notice, since it's free and Amazon works the same regardless, but I like to be on the up-and-up anyway. I'll keep an eye on this (and attempt it myself) I'm in the same baby-registry-boat! I hope that this is successful for you guys. You deserve to make a living at this -- you guys work too hard. I'll throw in my vote for Patreon as well. I don't have a PayPal account (bad experiences) and living in New Zealand, ordering at Amazon isn't really a thing that makes sense (so expensive). However, I have been supporting a few people on Patreon for a couple of months now and it's been a really good experience. PS: Here's the link if anyone is interested: Baby 'Bot shirt! YES! I have been waiting for this moment for years, no joke. You and John have been the source of so much enjoyment, laughter, community, entertainment, knowledge, and most importantly: hope. I'm so excited I can give back in a tangible way, because you guys are the bomb, and everything you've done for us for so long for free has been incredible. Thank you, thank you, thank you. Also, if you ever build that geeky commune, I volunteer my services in the kitchen. I make a mean lasagna. Guilty RSS reader here who promises to open both sites in my browser from now on, without ad blockers. Since I too was recently diagnosed with Hashimoto's AND a Dairy Allergy AND Gluten Intolerance and I LOVE to cook, I would gladly help John in the Commune Kitchen! I've been using your linky to Amazon for a while now and will continue to do so. Do put a link in every post! I use amazon a lot and am terrible at remembering to go through the link. Also, because of the super broke thing, I would be totally interested in the geeky commune. I'm a hell of a cook, so I could help John with that. That's really my only commune specific skill, unless you can use my video game design training. Commune video games? I'm one of those who have been bugging you to accept donations. I see it less like some beggars cup and more like one of those good charities whose great contributions to society are funded by people who wants them to keep it up. Also I see it as if a friend has been helping me for a long time, refusing anything in return and now finally allowing me to return the favor and give something back. And then there is the fact that this actually is your job, you love it and excel at it and deserve to make a living off of it. So, what I'm trying to say is that you're quite far from shaking any virtual coffee cup. You are at work, creating a wonderful product which is not forced upon anyone (except by their friends) and now finally accepting voluntary payment from satisfied customers. I hope you will get to see it this way too some day, but until then you will just have to believe us when we say that this is how your fans see it. Subscribing for a $1 a month because what a great way to spend a dollar. :) I love this blog and Cake Wrecks. You've really helped contribute to my crafty side and my Etsy addiction. $1 a month for Epbot to stay around? Yes please. You two are like (virtual) 'fambly' at this point - of course I'll chip in to buy you some cat groceries!! :) Just signed up for a monthly contribution. A calendar is a GREAT idea. I was looking at my Firefly calendar here at work yesterday (Hello, Simon), and wondering what Geeky calendar I could find for next year. (I have Doctor Who at the house). An Epbot calendar would be so much fun! I know J&J have got lots of plates spinning already, but if they do something like a cat/EPBOT/CW calendar, it would be great, right?? Hopefully they'll take it under consideration and if it's not doable right now, it will be next year. J&J could easily set up a Zazzle store and offer Epbot 'bot and Lily/Tonks calendars, buttons, magnets, stickers, etc. and make a nice royalty on them, too! I use your CW Amazon link all the time, so now I have another one to use - yeah! Keep those links up -- I'll have more $$$ after Christmas. I totally get the "I need to feed my cats" thing. THANK YOU, Jen and John (thoj)!!!! Your blog has been such a contribution to me & my kids. We've learned about so many of our favorite things from you & John and I am thrilled to get to give back a teeny bit. Hey, Jen, I signed up to get Epbot delivered to my email, but now I'm wondering if you get any benefit from that. I could always use it as a notification and then go to Epbot directly to read it. What works better for you? I have updated my Amazon button on my toolbar to direct to your link! YAY!! Keep writing, and we'll all keep enjoying it! I would love to support you monthly on Patreon! I read your blog all the time. I first found Cake Wrecks when I was starting out as a hobby baker, and made my way over here. I love having a geeky little girly corner of the web to hang out in :-) You inspire me to be more crafty (as evidenced by my making a LOTR quilt for my friends' baby, and the 5 hours I spent using my daughter's 1st birthday crepe paper to decoupage). I also am a cat person, so I will gladly help feed your kitties! Signed up for a monthly subscription. I love this blog. I admit when I pictured the commune I actually said "oooooh" out loud. It would have the best decorations and artwork and we would all wear fabulous jewelry! I normally read through RSS but some of the blogs I have on there don't let me read the full post on the reader I have to click through, could you set Epbot to do the same? Yes, but I know that annoys people. :) For now I've set it up so posts with page breaks require a click-through - but I suppose I may change that in the future? A teeny monthly sub set up from Jones and Temple to Lily and Tonks. Those dollars all add up, right? Hello from Montana! Just got set up for monthly donations! Thank you for continuing to share your life with us. :) I remember that during a Christmas gift exchange a few years ago, my Mom received a copy of the first Cake Wrecks book. My entire family was laughing so hard flipping through it that we were in tears. Later, I found Epbot and I feel so fortunate that I have. Your posts about fandoms, crafts and your journey through life have been such a huge inspiration to me. Please, please keep up the good work. Hurray! I feel illogically proud of this new option because I once posted a comment requesting a more easily accessible Amazon-affiliate button on the Epbot site since I never remember to scroll all the way down to the bottom of the page for the teeny-tiny linky. Just wanted to say how much I LOVE Epbot (and you and John!) and please don't feel weird at all for asking for us to pitch in a little for the content that we love to see! You have seriously inspired me to get more crafty (I did those floating Harry Potter pumpkins for Halloween that I posted on your Facebook!) and also to embrace my geekiness for Harry Potter! I absolutely love how creative you and John are and how you embrace your geek! THANK YOU!!!! I'm dabbling in my own starter company, but from one "starving artist" to another I have shared a small monthly subscription. Hopefully as I grow I can throw more towards my subscription. It's just like supporting NPR. I receive a service and it's worth giving money to continue receiving the service! Hey Jen, I'm happy to donate but would also like to suggest that when you're done decorating your house, you decorate ours! And by ours, I mean the world's. I'd be more than happy to pay for your decorating skills (which are epic) and you could feature the work on the blog. I've never been able to find a geek friendly interior designer, so even a consultation with someone like you would be a rare and wonderful thing. This is a brilliant idea! Geek design consultant - we've also seen you do adorable geeky baby stuff too - and I would totally pay for your services!! Would you make my commune house a Hobbit house? ;) Because I would throw crazy money at you if you could, lol. Could you please remind me after payday! ;-) I'm in - your cats need feeding, of course they do! If you go to Patreon, I'll add you to my list of folks I donate to in a heartbeat (I greatly dislike Paypal). Granted, I am but a poor college student and it'd only be a dollar. Once I finally get out of school, I'm hopeful to increase all my donation amounts. I love your content, humor, and view on life. So thank you for that. And I've added your Amazon link to my bookmarks. The amount of joy, inspiration and entertainment I get from you is totally worth donating to. Please accept my humble donation and feed the kittehs, and yourselves! I would love to give to you on something like Patreon. I have a PayPal, but don't necessarily want to sign up to do something monthly through them. I will do a one-time donation for now and hope that you set up a Patreon or something soon. You and John and Lily and Tonks SOOO deserve to make a living at this. You have enriched my life so much and in so many ways. Please let us show you how much we love you! 1 - Totally subscribing monthly. I invest way more than that in music streaming service that keeps me sane at work, why wouldn't I do the same for a blog that connects me to my Nerd Herd?! 2 - I want in on the nerd commune! I'm an environmental scientist, so I can keep everything around us healthy and clean and pretty. Bonus for living in sunny Florida!! I'm a real fan of patreon because the artist spells out how the rewards system works. I support Amanda Palmer, who gets a donation per "big thing" she releases, and as many others have said my experience on the site has been positive. I would be interested in seeing how you structured yours because your "content delivery" is obvs different, but I'm a huge huge fan of supporting artists I love, and your blog (EPBOT) is the one I ALWAYS click on when my Google feed beckons. Fun idea: what about a Patreon-supporters-only button of the month for a $5-7 donation or so? You could maybe partner with some of the amazing artists on your art page for art. Anybody else like this idea? How about some kind of lottery, like the art giveaway, with things that you make? When you make things of shippable proportions you could make a couple extra for your supporters to win. Then we raise our virtual hands and you pick a couple of winners. Because I at least would prefer the chance to get something special you've made rather than a pile of buttons, however pretty they may be. We already get the main product, the blogs, so any extra rewards should be designed so they don't take any time away from the blogs. Never forget that the product we want to pay for is the same thing you've been giving us for free for years, so a chance to win something you've made on the blog is the best reward I can think of. That way it feels like getting an actual piece of the blog itself to put on display in our homes. The postcard I got from you a couple of years back still has a very special place in my bookshelf. Speaking of, maybe write new donors a postcard? Getting a personal letter from the creators of the best blogs on the Internet would make any geek all warm and fuzzy. I just visited Patreon to see what it was all about. If you can, I think you should have a monthly donation setup rather than per post or something like that. Because some posts are about very labor intensive projects that seem to take a lot of time and effort, then there are the shorter posts, often quite emotional that lets us into your lives. They are just as valuable to us as the jawdropping project - posts and I worry that you would feel like cheating if you get paid the same for a post you write on a whim as for a post that took weeks. Because we don't want that. So I feel like a monthly salary for the work that you do would be the best thing. There was also this kind of staircase where higher amounts gave better rewards. That feels kinda wrong here too. This is like a community of geeks, so everyone who wants to support you should get the same level of reward, no matter how much they can afford to give. I give what I can, but it would feel wrong that someone in a tighter economic situation who still choose to give would miss out because they don't have more to give. Cakewrecks on the other hand should be well suited for both payment per post and a reward ladder. Not sure what kind of rewards would be appropriate there though. I'm an amazon shopper, and I read both your blogs every single day of my life. Thing is, I often forget to go through your sites to get to amazon when I'm looking for something in particular. So, a link on every post may help. I will try to remember to go through your site to get to amazon more often. But not sure how it works...sometimes I just shop, and put things in my cart without checking out. If I've followed your link to put the things in the cart, do you get the donation when I check out, or do I have to be sure to follow your link when I check out? Probably, huh? Now that I think about it. Anyway, I don't mind be reminded every day. I'm never annoyed by bloggers including Amazon links or donate buttons or whatever. If you create content I want to keep coming back for, I want to pay you with more than just my thanks. I don't visit epbot every day, but often enough I'll be a subscriber for sure! You are why I have not installed adblock. We are fairly broke right now, but I load tour page every day, and even if I already read the post, I follow the FB link and hit like too. When we can, I will totally give you money. Will gladly donate in the morning, but I wanted to let you know right now that I wouldn't be surprised if the TARDIS came flying out of your kitty's beautiful eye! I've always wanted to know how to support blogs I love. I will for sure be using amazon through your link from now on. Epbot is my favorite, thank you for doing what you do! I had bookmarked the Cakewrecks link to Amazon shortly after you first included it there. I just replaced it with the link I copied from here, to make sure I did it right. I wish we could verify that you're getting credit by giving an order date and $ amount. I totally understand about cats being expensive. We were down to Jasper, age 13, with bad teeth and a low platelet count. In September we got Lucy, age 1, and then in October we got Charlie Brown and Sally, age two months. I'm buying twice as much dry cat food and scooping three litter boxes twice a day. The babies have giardiasis and Lucy has been grooming them, so all three are on 10 days of pills. One problem, every time I click on "Preview" my comment disappears. hihihihi!!! I was interneting and I figured out a thing!!! If you add "&tag=wwwcakewreckc-20" to the end of any amazon url, it'll (supposedly) turn it into an affiliate link. I am definitely going to be doing the amazon thing from now on, but I wanted to be absolutely certain that my money was being funneled as intended and this seems like an easy way to do that. Maybe? Throwing it out there, more tech inclined people than myself, please chime in! I always try to remember to click your link on CW when I purchase something from Amazon (I'm in Canada) but having it as a static button on either site would be helpful to people like me :) I will always support you in any way that I am able! Just happen to have an order sitting in my Amazon cart waiting to be completed. While reading through the other comments, I had an AMAZING idea. YOU (and John) should do a monthly or quarterly curated subscription box!!! OH my GAWD I would buy the heck out of that! Jewelry, Toys, Art, Crafting supplies, assorted geekery...oh man, I am getting myself very excited about this! Please, please consider it!! You could produce limited numbers (creating demand---just make sure I get in on the ground floor), and build in a bit of a pay cheque (yes, Canada) for yourselves and the cats. Why not just do everything? Some sites have a "support us" page with links to Patreon, Paypal, Flattr... I don't know... Bitcoin? Carrier pigeons with cash tied to them? I don't mean that as a rhetorical question. There may be a real down side to doing it this way besides the time it takes to set up all those accounts, I just don't know what it is. The upside is that it takes a step away for some people. I've had things that I've meant to support for months and months but the five to ten minutes it would take use some new type of payment interfaces got put on the "tomorrow" list over and over again. I opted for the monthly support, I've already got a few other places that my amazon goes to. Thanks for all you do Jen, you inspire me. Glad to contribute! Your sites keep me sane. (Well, somewhat sane). :-) Loved them both. And I want in on the commune idea! I don't mind cleaning. Or teaching everyone physics. But I think the teaching might be more useful. I wonder if you did an etsy store how well you'd do... Instant download tutorials that you could design to be put in a binder... I know you can get them free on here, but I am sure some people would pay a dollar or two to dl a nicely formatted printable version and you wouldn't have to do anything after the initial file creation/sales listing. It's not a lot, but it's sent with a whole lot of love. Meeting you guys at Epcot (which I seriously only found out existed due to CW when it kept appearing and I ended up googling it!) was one of my favourite things (my Mum has already asked if she can meet you guys when I take her to WDW in 2017!!) But yeah, seriously, so much love for your work!